WeWork is one of the largest providers of shared office space in the world, with over 10 million square feet of office space spread across locations in 16 countries and 23 cities in the United States. Shared office space can include private offices, dedicated desks in communal areas, or access to communal areas on a drop-in basis. 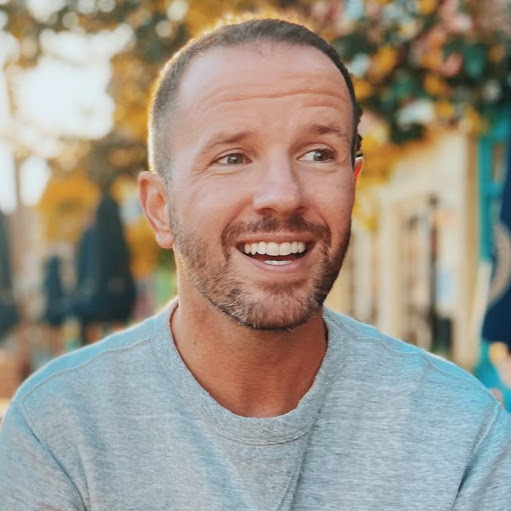 They’re particularly useful for startups, solo entrepreneurs, and freelancers who want the benefits of cutting-edge facilities without the cost. 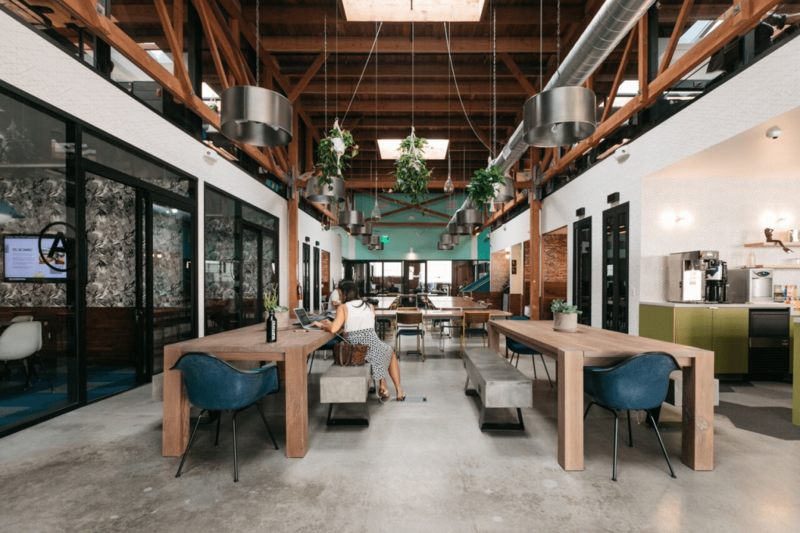 In this article, we will give an overview of WeWork’s facilities, the benefits of shared office space, and WeWork pricing in different cities. You can expect to pay from $350/month for a hot desk or from $750/month for a private office in Chicago, from $350 for a hot desk or from $700 for a private office in New York City, and from $400 for a hot desk or from $780 for a private office in San Francisco. Specific pricing will vary depending on the location and the type of workspace membership — we cover some popular examples in our guide below. We looked at some of their most popular locations in ten different cities to give you an idea of the range of pricing you can expect. 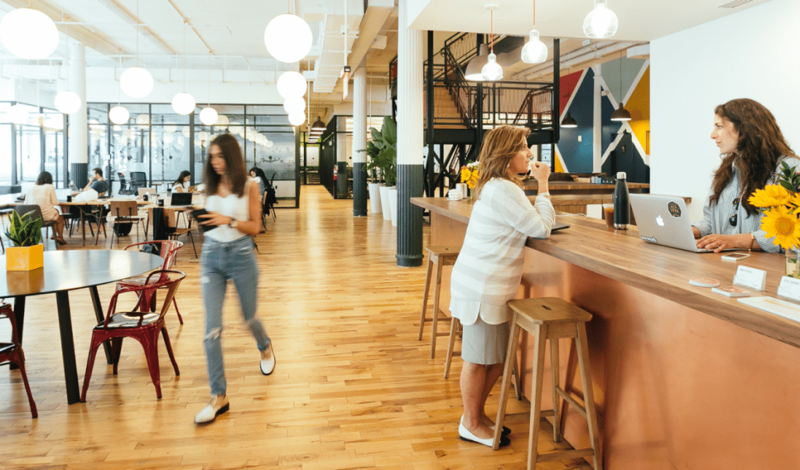 For cities with more than five WeWork locations, we chose five to provide a sample — therefore, this is not an exhaustive list, but rather a sampling of locations. Visit WeWork’s website for a complete list of the most up to date pricing. WeWork has three locations in Atlanta. Monthly memberships for individuals start at $220 for a hot desk, $350 for a dedicated desk, and $500 for a single private office. Monthly memberships for teams start at $960 for a two-seat private office to $3,900 for a ten-seat private office. Larger private offices are also available. WeWork has four locations in Austin. Monthly memberships for individuals start at $350 for a hot desk, $450 for a dedicated desk, and $700 for a single private office. Monthly memberships for teams start at $1,320 for a two-seat private office to $5,450 for a ten-seat private office. Larger private offices are also available. WeWork has four locations in Boston. Monthly memberships for individuals start at $350 for a hot desk, $425 for a dedicated desk, and $610 for a single private office. Monthly memberships for teams start at $1,300 for a two-seat private office to $5,500 for a ten-seat private office. Larger private offices are also available. WeWork has six locations in Chicago. Monthly memberships for individuals start at $350 for a hot desk, $425 for a dedicated desk, and $700 for a single private office. Monthly memberships for teams start at $1,040 for a two-seat private office to $3,900 for a ten-seat private office. Larger private offices are also available. WeWork has two locations in Denver. Monthly memberships for individuals start at $350 for a hot desk and $600 for a single private office. Monthly memberships for teams start at $1,140 for a two-seat private office to $4,950 for a ten-seat private office. Larger private offices are also available. WeWork has two locations in Denver. Monthly memberships for individuals start at $350 for a hot desk and $600 for a single private office. Monthly memberships for teams start at $960 for a two-seat private office to $3,300 for a ten-seat private office. Larger private offices are also available. WeWork has 44 locations in New York City. Monthly memberships for individuals start at $350 for a hot desk, $450 for a dedicated desk, and $700 for a single private office. Monthly memberships for teams start at $1,200 for a two-seat private office to $5,000 for a ten-seat private office. Larger private offices are also available. If you’re looking for a coworking space in NYC, check out our NYC shared and coworking space directory that lists all of the options that the city has to offer. WeWork has 15 locations in the San Francisco Bay area. Monthly memberships for individuals start at $400 for a hot desk, $500 for a dedicated desk, and $780 for a single private office. Monthly memberships for teams start at $1,250 for a two-seat private office to $5,800 for a ten-seat private office. Larger private offices are also available. WeWork has three locations in Seattle. Monthly memberships for individuals start at $300 for a hot desk, $400 for a dedicated desk, and $550 for a single private office. Monthly memberships for teams start at $1,040 for a two-seat private office to $4,250 for a ten-seat private office. Larger private offices are also available. WeWork has ten locations in Washington, DC. Monthly memberships for individuals start at $300 for a hot desk, $400 for a dedicated desk, and $610 for a single private office. Monthly memberships for teams start at $1,160 for a two-seat private office to $4,500 for a ten-seat private office. Larger private offices are also available. In addition, every WeWork location negotiates with other service providers for better group rates for its community members. 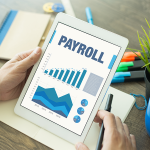 These can include health insurance, software license subscriptions, gym memberships, and other services that vary by location and community interest. Startups, solo entrepreneurs, and freelancers face unique challenges while growing their businesses — how can they find comfortable, convenient, and collaborative workspaces with the amenities of an established office but without the cost? 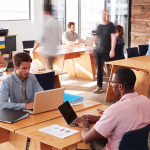 Shared office spaces, like the coworking and private office spaces offered by WeWork, solve this problem. For as little as $250/month, depending on your location, you can have access to world-class facilities, a community of other like-minded professionals, and the facilities and equipment you need to actively grow your business. Spend less time worrying about your workspace and more time doing those things you do best — building your ideas and serving your clients.